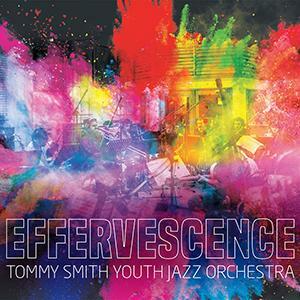 The Tommy Smith Youth Jazz Orchestra is the youth arm of the inestimable Scottish National Jazz Orchestra: Tommy Smith, head of the jazz programme at the Royal Conservatiore of Scotland and the (grown up) driving force behind both orchestras, won the 2016 Jazz Educator of the Year at the Parliamentary Jazz Awards, in part for his work with TSYJO. There is a lot of cross fertilisation between the two bands, with members of the junior orchestra moving up to take seats in SNJO, and players from SNJO acting as mentors to the TSYJO, such as trumpeter Tom Walsh, who adds a bit of weight to the trumpet section on this disc. "Effervescence" can mean bubbly, vivacious and enthusiastic, an apt name for this record. It contains seven standards and one tune written and arranged by trumpeter Sean Gibbs, Tam O'Shanter, part of Gibbs' collection of tunes based on poems by Robert Burns released by the Birmingham Jazz Orchestra. Gibbs' tune is perfectly at home amongst work by Woody Herman, Benny Golson, Dizzy Gillespie and Chick Corea. Several of the tunes are arranged by Florian Ross, who is a regular collaborator with the SNJO. He adds verve to Jerome Kern's The Way You Look Tonight, Shorter's Nefertiti (credited to Miles Davis) and Corea's Humpty Dumpty. A second Corea tune, his homage Bud Powell, has been arranged by Christian Jacob, and the orchestra tackle original arrangements of Herman's Apple Honey, Golson's Blues March and Gillespie's Things To Come. There is no doubt about the musicianship of the TSYJO. The band contains several winners and finalists from the Young Scottish Jazz Musician of the Year, including this year's winner, bassist David Bowden; the other members of the rhythm section have all been finalists, and the other sections have their fair share, too. Many members of the orchestra are bandleaders in their own right. This would be a good disc by any band: one need make no allowances the players' age. They are well-drilled, the unison playing punchy and energetic, which pushes the soloists on, too. It is a young band in which everyone shines.